I recently came across the excellent CoC Operation Martlet campaign write up on http://tinyhordes.com/tag/martlet-campaign/, so decided to try the first game using IABSM on my mini-board (2’ x 2’) in 1/300 H&R. The thick black line bottom centre to top right is the main road and has a few farm buildings and a church, so to convert that to a wargame layout I've added the high stone walls favoured in Normandy around the farm and a low wall around the church. There is an orchard on the right. ‘A’ marks the British entry point along a narrow track towards a large building on the main road. A church with a spire is at the German end. The Germans had two depleted SS PanzerGrenadier Platoons, each of two squads with two LMGs each, along with Panzer IV H and 'fausts plus an MMG and a Panzershreck. 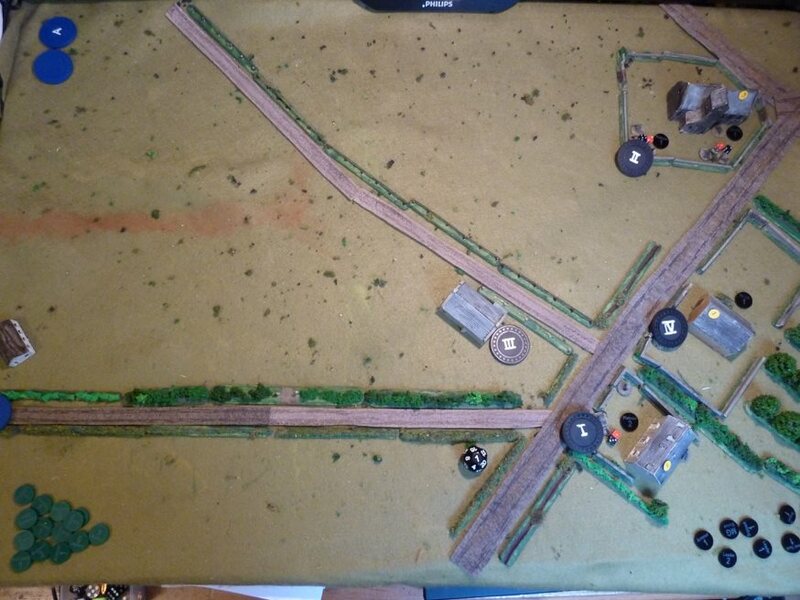 The German deployment: #I platoon are around the church (confusingly labelled II), #2 platoon (labelled I) are around the walled farm house and adjoining large farm shed. There's an MMG in the top floor of the farm house, able to fire down the track and into the fields. The kill/shock dice show the effects of the pre-game artillery stonk. A Panzer IV and Panzershreck team lurk in the farm house yard with a view out of the gateway. Looking at the terrain, all that open ground on the left is looking like a bit of a challenge to a British infantry company, so I added a fourth platoon of a Vickers on a carrier, a 3” mortar battery, and a troop of Churchill Mk VIIIs (probably should have been MIVs for historical accuracy), plus the pre-game stonk. But I prefer to kill things with my mortars, so the farmyard comes in for some 3” mortar love! While the British #2 & 3 platoons move forward, the Germans are holding fire until the British squaddies are within effective range. There is a Churchill in support on the right and another two on the track moving very slowly! 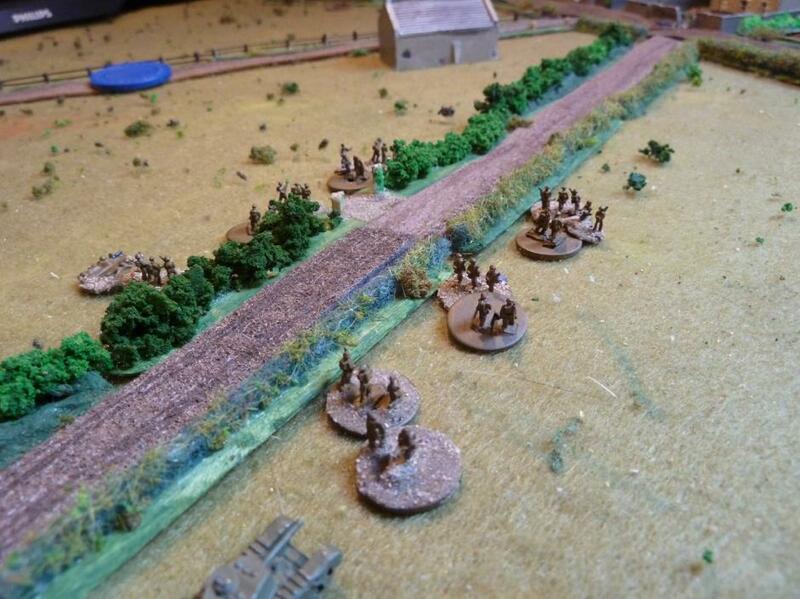 A further platoon, still under a Blind moves, down the fenced track looks nervously at the church on their left. 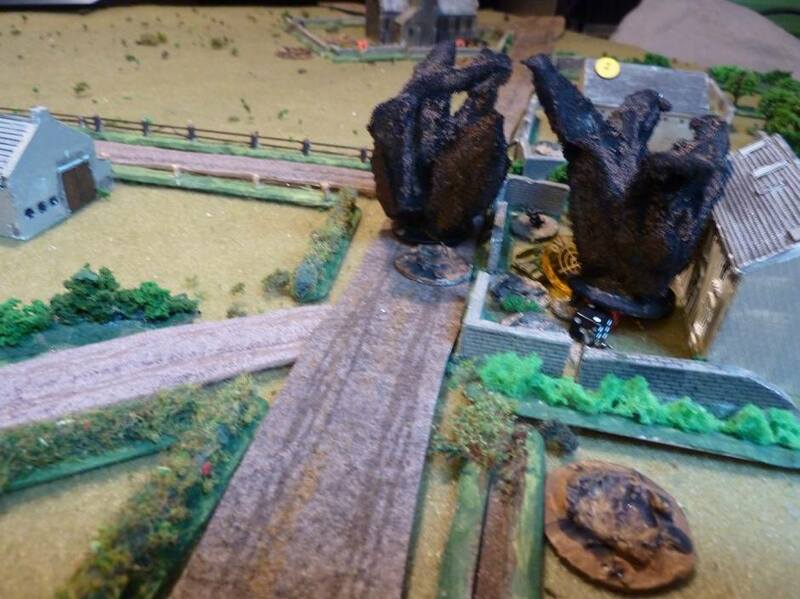 The German Panzer IV opens fire from the farm house front garden (see white smoke in the gateway) at the the Churchill, left out of shot on the road. Meanwhile another Churchill has nipped through the field on the left of the hedge and in through a gate, and it too exchanges fire with the Panzer IV in the farmyard. Luckily those Churchills are just tough enough to stand up to the 75L48, but their guns just can’t seem to punch through the Panzer IVs armour: lots of hits on both sides, with the shock and damage starting to mount on the Panzer. A view from above and lots going on. The Germans in the church are being screened by some 2" mortar smoke. The platoon on the fenced track is not visible and moving forward tactically. 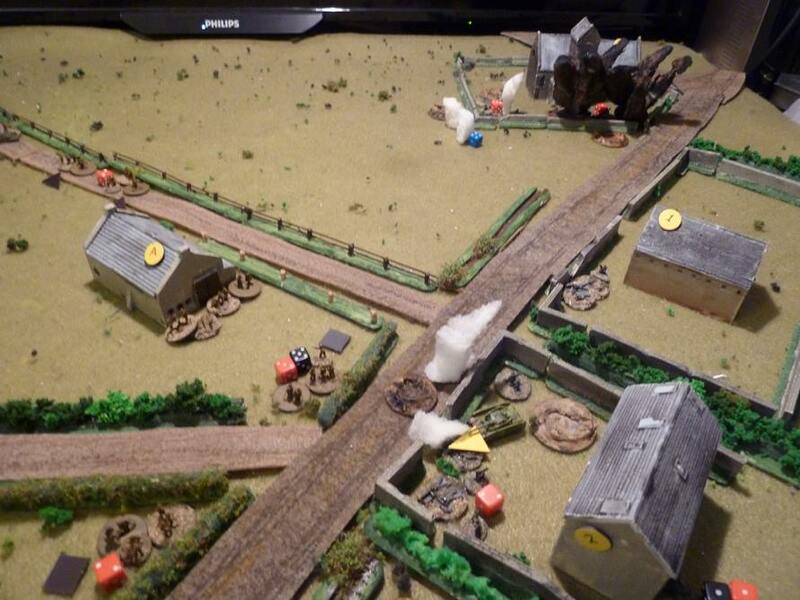 My middle (No 2) platoon's first section has been ambushed by the MMG in the farm and nearly wiped out. The remains of the platoon are in the big barn with a yellow dot and A on the roof firing like mad to suppress the MMG. 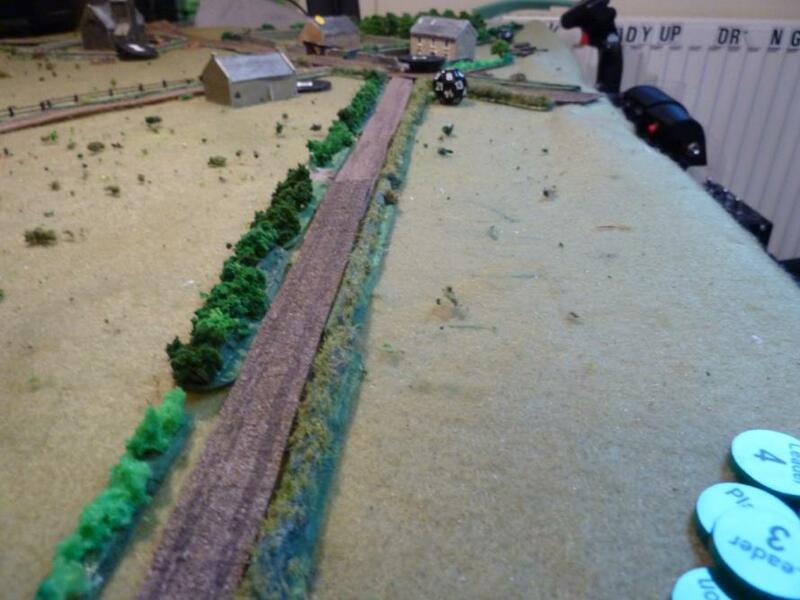 My #3 platoon at the junction has thrown a smoke grenade into the road and two sections have dashed over into the ditch bottom right moving tactically to try and get around the back of the farm house, covered by the remaining section. More 2" mortar smoke has scattered. My Churchill in the road has accumulated three Shock and is about to bail. A PIAT team has jumped into the road to add to the fire at the Panzer IV. And it was a very lengthy turn with the Tea Break chit coming out last! The Germans in the churchyard get some 3” mortar attention, while the Vickers in a universal carrier just visible on the fenced track adds to their misery, firing at ‘short’ range, keeping them Pinned and slowly adding Shock despite the hard cover of the low wall around the church. Massed return file from the British squads in the barn start to inflict Shock/kills in return on the platoon in the farm and MMG. The Panzer IV suffers track damaged (the yellow triangle). The epic tank duel continues, while two sections come out of the ditch and move down the alarmingly green hedge to flank the farm house. 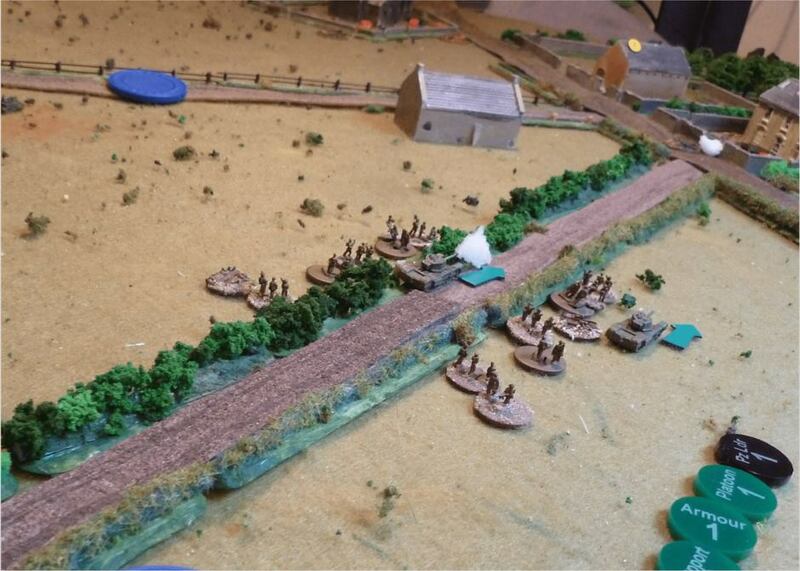 The final assault: two squads from British #3 platoon storm into the rear of the farm house to take out the MMG upstairs and attack the German squad out in the front garden from close range. The British squad, once on the ground floor fire at the German squad from behind and with some great shooting, wipes them out! The other squad dashes upstairs and deals with the MMG. The Panzer IV has been hit multiple times: the Shock has reached 5 and the crew has had enough and they’ve run (I need to make some tank crew units). At this point it's all too much for the Germans: the Panzer IV has been abandoned, one squad wiped out, another routed at the church, the remaining two decide to slip away. I used the morale system from Summer/Winter specials – Germans dropped a couple of points, but didn’t really kick in. AT fire has modifiers for range and penetration and vehicles have discrete front/side/rear values – not sure if this really adds anything, the original rules being a very simple/elegant solution. Churchills armour is too tough for Pz IVs … but their gun is dire! 3 Churchills v 1 Pz IV and eventually they batter it into submission. • Even an SS PzGren squad with 2 LMGs can be over-powered by 3 or 4 British squads at close range. Maybe I reduced the German force a little too severely and should have stuck with 3 squads each.